When James Bond and Ernie Cureo are being chased by the hoods in the old model Jag in Diamonds Are Forever, they take a detour in hopes of finding a place to hide from their pursuers. The cab came to rest in the back row of half a dozen ranks of cars lined up to face the concrete screen that soared up into the sky and on which a huge man was just saying something to a huge girl. “Passion Pit” was 1950’s slang for a drive-in movie theatre. Couples could go in the privacy of their own cars, and (pretty much) do as they liked. Based on the slim descriptions Fleming gives – near Boulder Dam road, near 95, it would seem that he was referencing the Skyway Drive-in Theatre, a facility that was located off the Boulder highway and close to 95. It was closed sometime in the early 1980’s and is now the location of the Boulder Station and Casino. 1955 Ad. These movies may have been playing when Bond was there. “He’s daft,” said the driver. “He’s crazy about the Old West. Bought himself a whole ghost town way out on Highway 95. He’s shored the place up-wooden sidewalks, a fancy saloon, clapboard hotel where he rooms the boys, even the old railroad station. Way back in ’05 or thereabouts, this dump-Spectreville it’s called seeing how it’s right alongside the Spectre range-was a rarin’ silver camp. For around three years they dug millions out of those mountains and a spur line took the stuff into Rhyolite, mebbe fifty miles away. That’s another famous ghost town. Tourist centre now. Got a house made out of whisky bottles. Used to be the railhead where the stuff got shipped to the coast. Well, Spang bought himself one of the old locos, one of the old ‘Highland Lights’ if y’ever heard of the engine, and one of the first Pullman state coaches, and he keeps them there in the station at Spectreville and weekends he takes his pals for a run into Rhyolite and back. We read later that took about two hours to drive from Las Vegas to Spectreville. The town of Spectreville is fictitious, while Rhyolite was a real town. John Griswold puts forth the theory that Fleming (mistakenly) referenced Spectreville when he really meant Rhyolite, seeing as how Rhyolite fits better for distance and time to drive there. Griswold’s work is amazing, and I enjoy that he attempts to put every scene in the Fleming novels into context and make it “real” in terms of making everything in the stories fit together and be completely plausible. While I appreciate and admire that approach, my own is slightly more pragmatic. I like to look at the real places Fleming mentions and see what inspirations he drew from them when creating the fictional locations of his stories. To me, it’s simple, Spectreville was not real, but Ian Fleming got much of his inspiration for it from the town of Rhyolite. For the real aspects – there is a Specter Range in Nevada, and it is where Fleming says it is. There is also a ghost town of Rhyolite, founded in 1905, (or thereabouts) and it is about 120 miles northwest of Las Vegas. It is off of Highway 95. So at 60 miles per hour, it would take about two hours to make that drive. Rhyolite has a house made of bottles. The rail depot still stands. When James Bond arrives in Las Vegas in Diamonds Are Forever, he hooks up with cab driver Ernie Cureo who brings him to his hotel, The (fictitious) Tiara, while showing him some of the other (real) hotels on the strip. They passed a motel with a swimming pool which had built-up transparent glass sides. As they drove by, a girl dived into the bright green water and her body sliced through the tank in a cloud of bubbles. The old Mirage Motel with its famous swimming pool. “On ya right, The Flamingo,” said Ernie Cureo as they passed a low-lying modernistic hotel with a huge tower of neon, now dead, outside it. “Bugsy Siegel built that back in 1946. 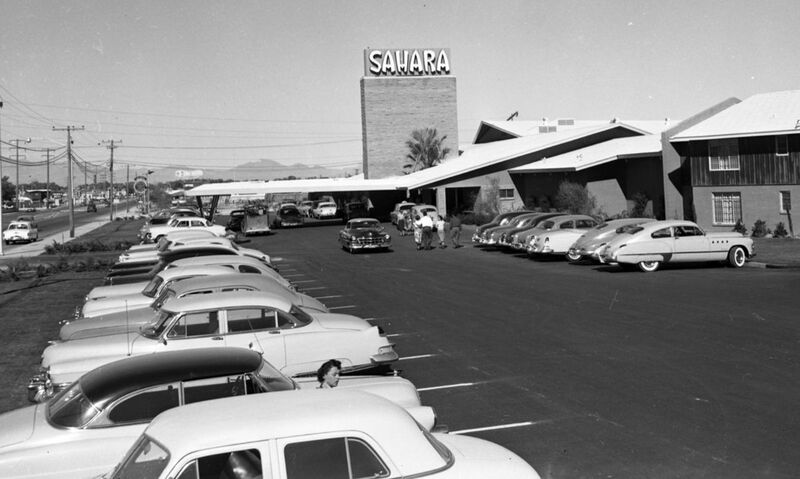 “Well then, here’s The Desert Inn. Wilbur Clark’s place. But the money came from the old Cleveland-Cincinatti combination. And that dump with the flat-iron sign is The Sahara. Latest thing. Listed owners are a bunch of small-time gamblers from Oregon. Then,’ he waved to the left where the neon was wrought into a twenty-foot covered wagon at full gallop, “Ya get The Last Frontier. That’s a dummy Western town on the left. Worth seein’. And over there’s The Thunderbird, and across the road’s The Tiara.